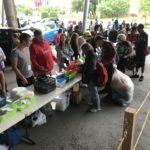 A big thank you to the 27 volunteers who did not let the storm stop them from coming to help out at our May 17th giveaway. We only had the opportunity to serve 51 people because of the early rainfall, but your dedication and generosity was greatly appreciated. For everyone who could not attend because of the storm, no worries – you can join us at our next giveaway on June 14! 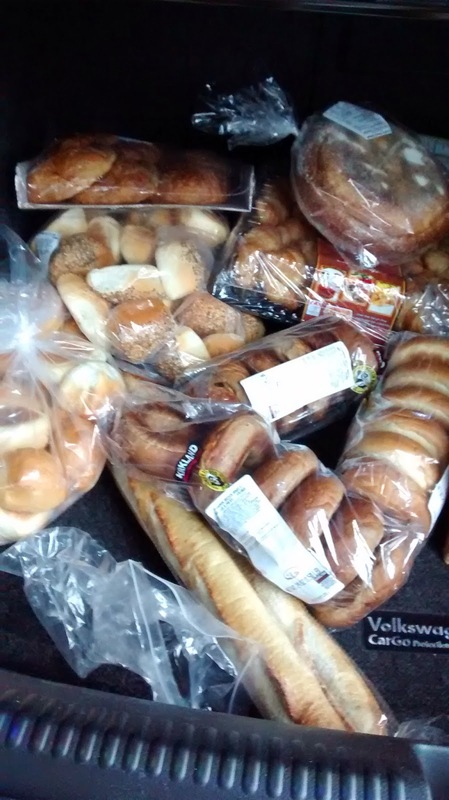 We appreciate all of the support that we have received recently, from the Seekers of the Good and the people from St. Andrew’s who came by to lend a hand. 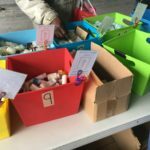 We also had some help from Girl Scout troop #116, who donated a supply of homemade first aid kits, which are always needed. 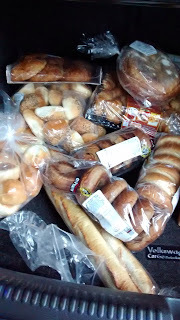 In addition, there was a generous donation of 200 snacks (bread, croissants, cookies etc.) from Trinity UMC. Thank you to everyone who contributed, with either your time or your resources, in caring for others. Hope to see you again next month! This is in no way a hostile position toward you. I have much love and respect for the journey a person takes throughout their life. Everyone moves down the path that speaks to them and I don’t wish to take away what gives your life meaning and solace. It has taken me 35 years to traverse these roads, I can appreciate the peaks and valleys of my own journey to know no two roads are the same and they lead each of us to very different destinations. However, I feel ever connected to this planet and the humans I share it with, I couldn’t be where I am without many of you. 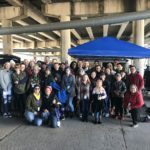 Since joining Austin Atheist Helping the Homeless in March of 2014 I have had nothing but good experiences with the many lives I’ve touched. 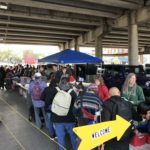 We help those who are religious and even have had theists help through donations or by volunteering at giveaways. This brings me to my main reason for joining ATXAHH, their reputation of inclusivity and no one is turned away for their beliefs. The organization also doesn’t proselytize or hand out any literature. I have no intention to change or convert anyone to my way of thinking but rather to make people aware good can be done by folks from all walks of life, including atheists. Since the beginning of 2015 we have had a regular presence of very brashly vocal theists: preaching loudly through bullhorns; an intrusive hugger with a bugle; an individual prayed over the space we occupied to rid it of our atheist presence; even had a few opposing theists come through our line who didn’t take anything but chose to be verbosely negative to volunteers as they cruised the line. We are going into June giveaway time and I wonder what will happen this month. In my mind, things have been happening so often now, it’s almost expected. In every group there is your share of extremists. Atheist and theist alike, we all have them. We also live in a country where we are not put to death for our differences and we can voice them at any given moment. Though, extremism tends to give way to public verbal persecution. Where does free speech start and harassment begin? Peaceably, I would like to say I can shake off moments we share, but why is this something I have to deal with, since clearly, you are the one with the problem. I don’t understand your display of abhorrent dissent and possibly will never be comforted in your presence. So here we are, my group shows up to give back to our community and here you are wanting us to change our ways to submit to beliefs we don’t subscribe to. In no way do we expect you to give up your faith, but you expect us to become devout in yours. I don’t see love, compassion or grace in the messages you are sending and am baffled as to what it is exactly you are trying to accomplish. Is this effort to cast us away from such a holy place only believers can tread? Do you really know what the end game looks like? All I know, even with all these questions I have, I am not swayed from what I have set out to do. I will continue to show love, compassion and grace, even to you. I will continue to respect those I serve each month and I would help you if you were in need. I will also give much care and effort to those I encounter each month and as I show them love, I will also love you as I love myself. Even though those last lines are some very famous words from the Bible to live by, I don’t think theists are the only persons who should live by them. My last question to you is, are you really doing those words justice?